The CATS robotics research focuses on the interaction between multiple robots and also with humans. Applications include handling and manipulation of flexible and bulky objects, human-robot collaboration in construction and assembly, and robot assistant and companion for patients and elderly. The CATS Robotics Lab houses several multi-robot-arm platform, including a recently acquired Yaskawa Motoman SDA10 dual-arm system, two PUMA robots on platforms, and multiple iRobot CREATE mobile robots. To make a robot intelligent, it must be able to sense its environment. The demo will show an Xbox Kinect sensor mounted on the Motoman torso to sense the presence and gesture of humans. It can be programmed to mimic the human movement or interpret the gestures as commands. Each arm will also be equipped with a force/torque sensor and a three-finger robot hand to provide additional dexterity in manipulating loads such as flexible or fragile parts. 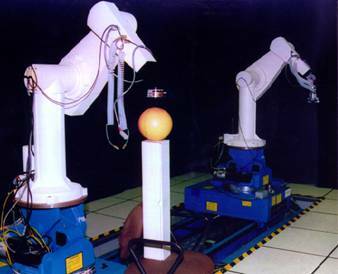 A particular research emphasis is on the safe and synergistic cooperation and coordination between the robot and human in the same workspace. To orchestrate all the sensors and robots, an open-source distributed control architecture has been developed at the CATS, called the Robot Raconteur, which has been applied to a number of platforms at Rensselaer, including the microassembly testbed, adaptive scanning optical microscope, and adaptive lighting testbed. CATS also has a GMF S-700 industrial robot arm and a Mitsubishi RV-1A rail-mounted robot are available for industrial and laboratory automation needs.